Just for fun, here’s a video clip. The quotes lines are the very first lines of the opera and thus the first lines in this clip. Interesting that again we have the theme of movement toward the east. However, here the sea is in stark contrast to the preceding desert. This passage then seems like, literally, a breath of fresh air, a relief from the dry, dusty passage in the desert. But does this represent a true turn away from the aridity of the desert or can the ocean be another form of desert? The wind blows toward home or from the homeland? The translations I’ve looked at differ and that seems to be a big difference, and one that would make for very different interpretations. Any German speakers want to give me a hand here? But I think we need to back up a little and look at the quotation in it’s original context before we can really understand what Eliot’s doing with it. The legend of Tristan and Isolde (Tristram and Iseult) takes place during the Middle Ages, when knighthood and the chivalric code prevailed. On board ship from Ireland to Cornwall, a sailor’s voice resounds from the rigging. His song about an Irish girl annoys the fiery [Irish] Isolde, who is being taken by Tristan as bride for his uncle, King Marke [king of Cornwall]. Isolde wishes the ship would sink rather than take her to her hated destination. Wagner’s story is derived from the medieval romance Tristan and Iseult, a romance more or less loosely connected to the Arthurian romances. The core story of the adulterous romance between the Irish princess and the Cornish knight echoes the fatal love triangle of Arthur, Guinevere, and Lancelot. Tristan is escorting the reluctant Iseult/Isolde to her wedding with his kinsman King Marke/Mark of Cornwall. 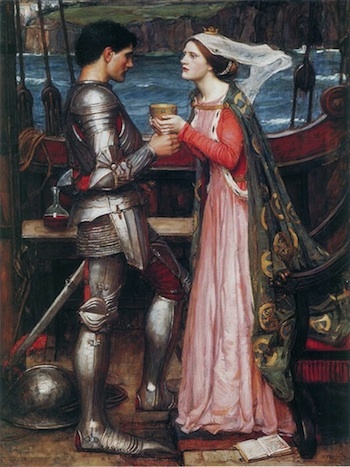 In all versions the love between Tristan and Iseult is the result of a love potion. In the version Wagner follows Iseult has reason to hate Tristan because he is responsible for the death of her former lover/fiance. Therefore she attempts to give him a poison but because of a mistake they both drink a love potion instead and fall fatally in love with each other. Versions of the story vary considerably, but the love created by the love potion and the love triangle are constant. So here Eliot again introduces the theme of illicit romance/love gone wrong—a theme that pervades the Arthurian material and in the form of infertility/sterility of the Fisher King is essential to the Grail legend—which will surface again and again in the poem. The love triangle will also appear later in the Waste Land in allusions to the figure of Cleopatra who was involved with both Julius Ceasar and Mark Anthony. What is it about the love triangle and misplaced passion? Part of it is that the impotence of the Fisher King is echoed in the cuckolded King Mark. Part of the “waste land” experience is that passions are disordered, unnatural and that love is frustrated and sterile. I think the Arthurian connection is not at all coincidental but connects to the basic structure of Eliot’s poem. In later versions of the Tristan legend Tristan is one of the knights of Arthur’s Round Table and a participant in the Grail Quest. The quest for the grail is the quest for that which will set all aright, will create right order and reign in the passions. Now to go back to the literal meaning of the words in the song, I think that verb “linger” is interesting. It reminds me of that voice that we identified as the tempter acedia which invited the traveler to stop under the shadow of the rock. There are many ways to avoid completing a journey, to avoid a homecoming or an arrival at a destination we don’t want to reach. I speak no German and I’m not familiar with this opera except in the synopsis I’ve read, so I welcome input from anyone who can give me a clearer idea how to read these lines and how these lines might fit into Eliot’s poem. And of course even if you are just as ignorant about those things as I am, I welcome any and all comments. What do you think about these lines? And, be honest, what blindingly obvious things have I missed? May God bless you and continue to keep you and all your tribe. I sympathize. I think you are having a harder time than I am in that all my kids are generally asleep by 8 and they don’t get up til at least 6. I am still tired and wonder just why kids have to eat so many times every single day, but at least I’m generally getting 7 to 8 hours of sleep a night. I always get fuzzy-headed in the first trimester and then I get to the second one and wonder what I was doing, oh, 8 weeks prior. I hope you are able to get some good sleep. My blog suffers mainly because I have thoughts but have an insanely hard time making them into anything coherent or even comprehensible. Thank you, Owen. May God bless you too. Thanks, Katherine. Fortunately this does tend to pass for me around week 14. Suddenly my head will be clear and I won’t want to throw up and things will be pretty good until I get so huge I feel like a beached whale. Thanks be to God I got a real nap today. More than an hour on the futon in the office. Just trying to take it one day at a time. Poor Melanie. I wish I was nearby so I could watch the littles for you and shoo you off for a nap. I know the morning sickness is coming for me, it always kicks in full force around this point. I just started bread for dinner, and the kneading motion was making me seasick. And I will always be highly anxious during my first trimesters, so even when I’m not actively sick, I’m just unbearable to be around. At least my husband is a good sport. Maybe you could try going to bed early and getting up before Anthony invades the bed? It could help with the sleep, and you could get your quiet time in in the early morning and let Dom deal with Anthony when he invades. I don’t know if that would disrupt your other children’s sleep though. During the school year, Mike’s alarm starts going off at 4:45am, and (as long as I can get to bed before 10) I’m essentially wired be up by 5. I can’t do anything that makes noise, or David will be downstairs like a shot*, but I can read, and (theoretically, of course) write blog posts. This doesn’t work during the school year, I have to be making breakfast then, but it’s nice during the summer. * one night I couldn’t sleep, so I went downstairs at 3 and emptied the dishwasher and started working on the obscene stack of dishs, and by 3:45 my son was downstairs asking when I was going to make breakfast! I can make coffee in the morning, but that’s about it. Ah, I am sorry these early weeks have been so rough for you! I hope the days pass quickly into that portion of pregnancy that is a bit more settled and energetic! It’s not actually Siberia, but it’s your Siberia for the present time. I have been where you are, and all you can do is endure. It does not feel heroic or holy. You muddle on through, dragging one foot at a time. I will pray for grace and for a window of rest.